Weekend Open Forum: How often do you clean your computer? As the resident “computer guy” for friends and family, it goes without saying that I’ve seen my fair share of PCs over the past 10 years or so. The majority of systems that find their way to me require a simple virus or malware scan to rectify the situation but every now and again I come across a computer that simply needs to be physically cleaned out with compressed air. 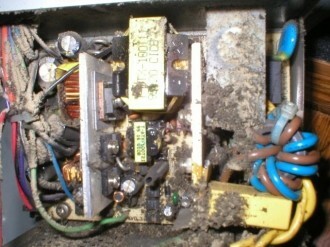 The attached photo shows the inside of a power supply in a system someone brought over several years ago. The owner told me that the system would blue screen after being powered on for a few minutes. Upon removing the side panel to have a look inside, I noticed the heatsink fan wasn’t spinning – it was so clogged with dust / dirt / nicotine tar that it had seized up. Working on neglected computers like this serves as a good reminder that it’s probably time to check on the hardware in my own system. Years ago before I had a dedicated system for component testing, I was tinkering with hardware in my system every other week so dust was not an issue. But now that I rarely open my work system, it’s certainly something I’m more aware of. With this week’s Weekend Open Forum, we want to know how often you crack open your desktop chassis to give your hardware a good once-over with some compressed air. We look forward to hearing from you in the comments below!